Pine Tree Lodge is a wooden log cabin located near Dollar in Scotland. It has three bedrooms comprising of a king size with an en-suite, a double and a single room, there is also a family bathroom, it can sleep five people. Also inside you can find an open plan living area with a kitchen, a dininga area and a sitting are with a woodburning stove. To the outside there is off road parking, a decking with furniture and a lawn. 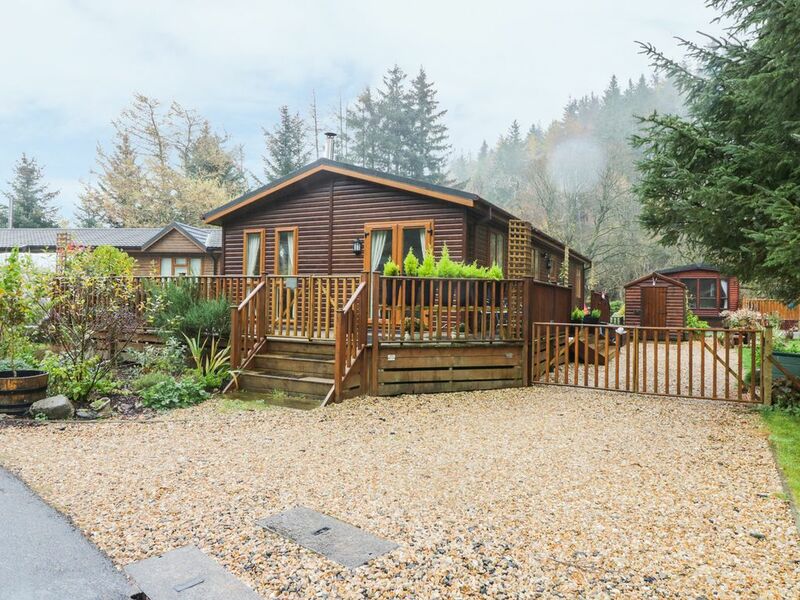 Pine Tree Lodge is a well-presented property in a great location for exploring this area of Scotland. Amenities: LPG central heating with woodburning stove. Electric oven, gas hob, microwave, fridge/freezer, washing machine, dishwasher, TV with Freeview, WIFI. Fuel, power and starter pack inc. in rent. Bed linen and towels inc. in rent. Travel cot and highchair on request. Off road parking for 3 cars. Decking with furniture and lawn. Two well-behaved pets welcome. Shop on-site or 7 miles away, pub 1.5 miles. Note: It is recommended not to walk to the pub as there are no pavements. Town: The town is overlooked by Castle Campbell and has walks towards it, it offers shops and cafés as well as a museum and golf club. The ciy of Stirling is 13 miles to the west with its dramatic castle and monument to William Wallace. Gleneagles and Perth are within easy reach, as is the Fife coast and St Andrews. All ground floor. Three bedrooms: 1 x king-size double with en-suite shower, basin and WC, 1 x double, 1 x single. Bathroom with bath, shower over, basin and WC. Open plan living area with kitchen, dining area and sitting area with woodburning stove. LPG central heating with woodburning stove. Electric oven, gas hob, microwave, fridge/freezer, washing machine, dishwasher, TV with Freeview, WIFI. Fuel, power and starter pack inc. in rent. Bed linen and towels inc. in rent. Travel cot and highchair on request. Off road parking for 3 cars. Decking with furniture and lawn. Two well-behaved pets welcome. Shop on-site or 7 miles away, pub 1.5 miles. Note: It is recommended not to walk to the pub as there are no pavements.